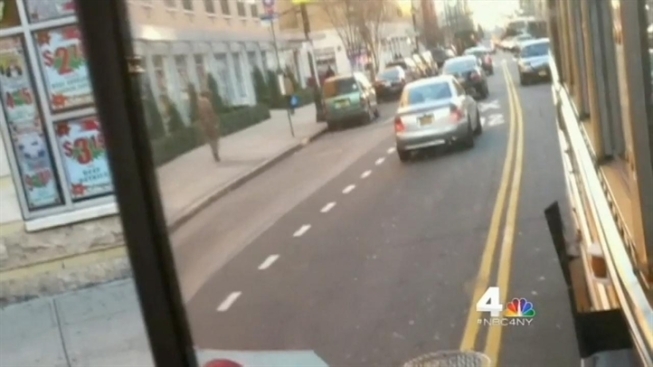 A Bronx school bus driver fed up with motorists ignoring the law and breezing by his flip-out stop sign decided to capture the drivers on video, and so he spent much of this school year recording them, one after another, speeding around his yellow bus. Mike Covino shared the videos exclusively with the News 4 I-Team. They show taxis, an MTA bus, and even a police car violating the New York state traffic law that requires motorists to stop in front of and behind school buses as they pick up and drop off children. "I've watched some of the kids get off my bus and come very close to getting hit by cars," Covino said. "I've seen parents in front of the school do it." Covino said he recorded the videos over several months on his iPhone, while parked to pick up elementary school kids. The penalty for running a school bus stop sign in New York is up to five points on a driver's license and a fine that can exceed $200. Over the last five years, the NYPD has written an average of 3,261 tickets for drivers who illegally run school bus stop signs. That is about one violation for every 440 school bus trips. According to the state Department of Motor Vehicles, 6,062 tickets were issued statewide last year to drivers who illegally passed a school bus, however, 1,316 of those tickets were issued on a single day set aside for enhanced enforcement. The I-Team spoke to several current NYC school bus drivers who claim they see drivers pass their flashing stop sign nearly every day. In front of P.S. 201 in Flushing, crossing guard Maria Koch said drivers routinely speed past school buses as they drop off students. According to Koch, some drivers have resorted to parking their yellow school buses diagonally across the street so other motorists cannot physically get by until children are safely on the sidewalk. "I've never seen a cop give a ticket," Koch said. The challenges in catching offenders have led several school districts in Connecticut to install cameras on the outsides of yellow school buses. "There is no upfront cost to a school district to use these cameras," said Charles Territo, of American Traffic Solutions, which offers the service to districts across the country. American Traffic Solutions takes a percentage of the revenue from fines generated by its cameras. If every city bus had a camera installed and each camera were to catch one driver a day during the school year, it could generate tens of millions of dollars annually in revenue. Before school bus stop sign cameras could be used in New York and New Jersey, bills that are currently in committee would have to pass each state's legislature. Covino, a bus driver for three years, recently left his job but supports the idea of installing stop sign cameras. "I am no longer a school bus driver, but I am still going to push this," he said. "I'm going to push this until somebody opens their eyes."